To access the Exchange Transaction from the menu bar of the main TeleTracker Online screen, click Transactions, then Exchange. To create a new Exchange, click on the New button located on the toolbar. To open an existing Exchange, select the Transaction from the Exchange list and click the Open button. All items marked in RED are required fields and must be populated before the Exchange can be saved. Select the Invoice Tab within the General Information Tab. 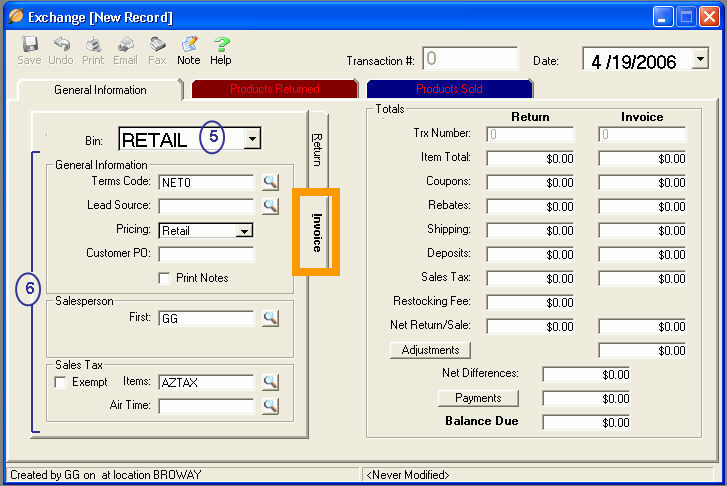 (1) Enter the Invoice # of the original TeleTracker Online Transaction. To perform a lookup of available transactions, click on the lookup button to the right of the Invoice # field. (2) **Select the appropriate Bin to place the returned items. 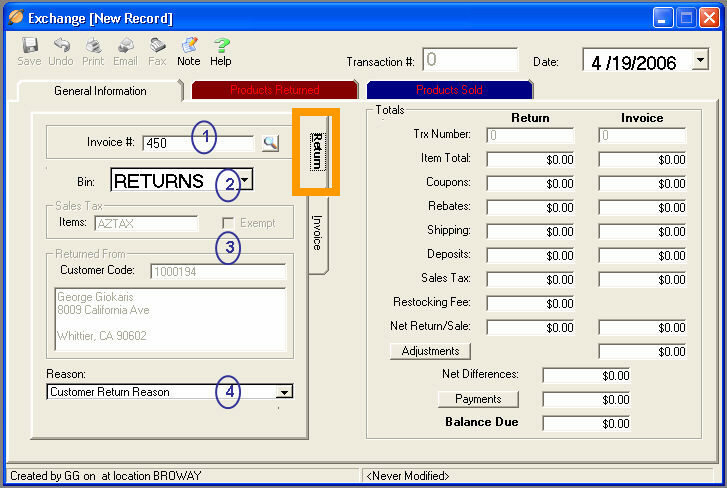 (3) Based upon the original invoice selected, the Sales Tax and Returned From fields will automatically populate. (4) Select the appropriate Reason for this customer return. (5) Select the appropriate Bin in order to sell products from. (6) **General Information, Salesperson and Sales Tax fields function and perform the same way as found on a regular Invoice. Visit the Invoice General - Step 1 help files for detailed information. Creating these defaults will aid in the speed of the sale and greatly decrease the manual input performed by the salesperson. The Exchange preferences will correspond directly with the preferences set for the Invoice and Customer Return.